Pretty much from that day in late 2007 when Joe Torre turned down the Yankees "offer" Joe Girardi was screwed. At least with the fan base. The Yankee fan base loved Joe Torre. "Mr. Torre" as Derek Jeter always called him, was the sole man responsible for 1996, Derek Jeter and the tickertape parades. Or at least that's how it seemed. And this is not to knock Joe Torre; he was a good manager. But the guy coming behind him, coming next, was screwed, no matter how well he managed. The blogs and chants to fire Joe Girardi began almost immediately. Halfway through the 2008 campaign, whispers began, the Internet crackled; "Just Fire Joe Girardi already!" "Girardi is terrible!" And so on Even up until now. After a 2 game losing streak last month, the Internet was fuming with calls for Girardi’s head. Kneejerk reactions aside, Joe Girardi has his team 1 game out of first place and is 1 of the best teams in baseball right now, as they have seem to have found the right mix of players to take them through the rest of the year. More to the point, I think Joe Girardi is a good manager. Let's begin with last year, when the calls for Girardi's head began before we were even halfway through the season. As most sportswriters should have known, Girardi came into 2008 in a bad situation. Not only was he replacing a beloved legend, he was handed an aging, creaky team, and conversely, was told to give untested, unp roved players real chances to prove their worth on the Opening Day roster. And don't forget—this is New York. "Rebuilding" and "patience" don't happen here. Not surprisingly, Jason Giambi underwhelmed, Bobby Abreu seemed terrified to go back on a fly ball and Jorge Posada broke down. So did Johnny Damon, Alex Rodriguez and Hideki Matsui, all of whom missed time. Oh, and every pitcher under the age of 28 seemingly got hurt. Chien-Ming Wang, Ian Kennedy, Phil Hughes, Joba Chamberlain, Jonathan Albaladejo and a myriad of other players were unable to answer the bell, so guys like Darrell Rasner, Sidney Ponson, Kei Igawa, the aforementioned not-ready-for-prime-time Ian Kennedy (before he checked out with his injury), the always hilarious Carl Pavano, and Dan Giese. Heck, even lifer bullpen man, Brian Bruney had to start a game (and was relieved by the immortal Billy Trauber). Handed that scenario, how do you think anyone would do? Well, Merlin couldn’t have done better than Girardi. 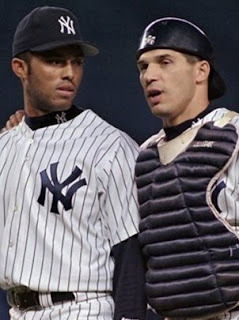 In fact, Girardi's 2008 decimated and overwhelmed pitching staff outperformed Torre's 2007 staff; 4.28 to 4.50—and that 4.50 was with a Stadium-seasoned Roger Clemens and a healthy 19-game winner in Chien-Ming Wang, as well as Scott Proctor, Mike Myers and a ridiculous Joba in the pen. Joe Girardi knows how to handle a staff. I don't think it’s any fluke that the bullpen's ERA dropped precipitously from 2007 to 2009. And I don't think it should be surprising that Alfredo Aceves, Phil Coke and Joba Chamberlain have adjusted extremely well to their roles in the staff. Everybody and their mother thought A. J. Burnett was going to have a rough time adjusting to New York—go ahead, search the web; you'll find a jillion articles saying just that—and take a look at how's he's done. 7-4 with a 3.83 ERA, and on a pace for over 200 K's. Think maybe he found a comfort level here, right away, something a lot of pitchers have problems with when they first come to New York. Also, take a look how Phil Hughes has performed in his role since being shifted to the pen. (A role I'm ecstatic he's keeping for the rest of the year, even with Wang's injury—nothing screws up a young pitcher faster than continually shifting him around.) Since being shifted to the pen, and being given a license to relearn his talent as a young phenom and just "let it rip," Hughes has responded with a 1.23 ERA, a .614 WHIP and a .120 Batting Average Against. The bullpen, an area where Torre was often criticized, has become a strength under Girardi. Early this season, it took a while for Girardi to find what he had out there. Now, it's arguably the best bullpen in the American League. In the last 13 games, the pen has rocked a 2.10 ERA. Considering that a boatload of innings in the beginning of the year were given to guys who were counted on to be a big part of the Yankees staff, who then underperformed and are no longer with the team—Jose Veras, Damaso Marte, Edwar Ramirez and Mark Melancon (not to mention Brett Tomko, who is still way, way back in the pen)—forcing Girardi to switch on the fly; considering all that, and that the pen is performing as well as it has been over the past month (only a 29% Inherited Runners Score percentage and a 72% Save Percentage), is remarkable. Finding roles for Phil Coke, Phil Hughes, David Robertson and Alfredo Aceves has worked out, to say the least. The rotation has done well, too. New York is notorious for being hard on new pitchers with big new Yankee contracts. Ask Mike Mussina, Jeff Weaver, Kenny Rogers, Denny Neagle, Roger Clemens, etc, etc. Yankee fans know that just throwing a pile of money at a good pitcher doesn’t mean he is going to come to the Stadium and achieve great success. There is usually a long adjustment period to playing in New York. If there is ever one at all. That said, it is remarkable how well Sabathia and Burnett have taken to playing for Girardi and Dave Eiland. Both have ERAs in the 3.7-3.8 range and both are on course for 18-20 wins. Remarkable that such a former pitcher’s catcher and now “clueless manager” (as one writer called him) could have such success with pitchers. In fact, take out Chien Ming Wang's mega injury-bloated ERA (rushed back by Brian Cashman, not Girardi) and the starters have a 4.04 ERA. OK. Maybe Girardi did wait too long to bench Melky Cabrera and Robinson Cano last year, but boy, did he send the right message. Since his benching, Cabrera has been a much more solid player, batting .280, and a mensch-worthy .362 with the game "late and close." Robinson Cano, likewise, after his benching last year has responded very well. Hitting coach Kevin Long was assigned to "watch over" Cano during the off-season. Cano has responded by hitting over .300 this year and playing a better 2nd base. Also, Francisco Cervelli's performance has been nothing short of revelatory. For a guy who was batting .190 in AA before being called up, to now be hitting .260—well, something is working. And the staff loves him, pitching at a better clip than when Posada is in there. And the switch of Jeter and Damon in the order—something I was against at first—has worked out pretty well. Last year the 1st and 2nd batting slots on the Yankees—occupied mostly by Damon and Jeter, respectively, batted .291 and .287. This year, with Jeter leading off and Damon batting 2nd, those two spots in the order are hitting .318 and .302. Also, Jeter has 39 walks—he had 52 all of last year. Likewise, Damon has 39 walks so far—he had 64 all of last year. Jeter also has 10 HRs so far; he had 11 all of last year; and 17 stolen bases; he had 11 last year. Jeter and Damon also both have higher OPS+ numbers. While this can't all be attributed to switching their batting positions, it does seem to support the fact that they have both fit comfortably into their new roles. And let's not forget that Girardi won Manager of the Year while with the Marlins. And he won because, after the Marlin's fire sale, management gave him a bunch of guys they pulled from the phone book, put them on the field and told Girardi, "Go manage." And up until halfway through September, Girardi had these guys in the playoff race. Since the slow 15-17 start—with Alex Rodriguez just back from the IR and his bullpen completely failing him—the Yankees have gone 34-17. A .666 clip. Not too shabby, eh? But the most important thing is that Girardi has shown some flexibility. There were complaints he was a little dictatorial last season, so he became less so this year, shortening preseason practices and trying to reach out more to veterans. There were some complaints that he ran his players too hard, so now we have the A-Rod Day Off each week. He may not be Bobby Valentine sitting in the dugout with Groucho Marx nose glasses, but he is willing to adjust when he has to. This is not to say there haven't been bumps—Girardi has done some overmanaging. For example, there have been far too many sacrifice bunts for a team that has the lineup they do. And he still goes a little too long with his starting pitchers into games (Andy Pettitte), and sometimes replaces pitchers who are working when he feels another pitcher might be better (removing Phil Hughes for Brian Bruney). But heck, one night sportswriters complain when he doesn’t bring in Rivera in the 8th, then the next night, when he does bring him in, they complain he is overusing Rivera. That's New York. But just because he manages under a microscope of media and fan scrutiny doesn't mean he deserves to be fed to the wolves. And just because we sure did like the previous manager a whole bunch, doesn't mean that the new guy is terrible. As a matter of fact, I for one think he's doing a pretty good job. I always have felt that Girardi was a good choice for manager, just let him right out the rough patches in the beginning I was pretty sure he would sort it out. Of course, half way through the season, no one should be throwing a parade just yet. I totally understand about Phil Hughes as well. The Rangers called up on of their pitching prospects this year (Derek Holland), and he has been a reliever, starter, and back to a reliever since being called up. It is tough for anyone to make those kind of moves. More so when you are a rookie trying to find your way.